Paul Ince's Viral Wave on All Stars Mr. and Mrs.
Paul Ince’s Viral Wave on All Stars Mr. and Mrs.
How can a hand wave go viral? Ask Paul Ince. When introduced by Philip Schofield, he gave a wild windscreen wiper wave that has ended up all over the Internet. Ince, the popular football player, played 53 times for his country, scoring twice, and was England’s first black captain. 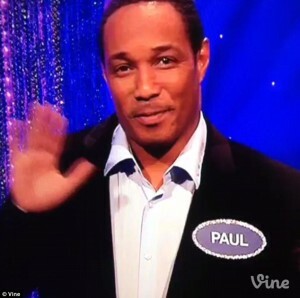 Paul Ince was a much-talked about footballer during his time playing for Manchester United, Liverpool and England – and now he has become an internet sensation for his waving technique. While appearing on ITV’s All Star Mr and Mrs on Wednesday with wife Claire, Ince was introduced by presenter Phillip Schofield and he performed a windscreen-wiper wave to the camera with an over-zealous smile for close to six seconds. The video has been turned into a Vine and has been shared many times on social networking sites. Paul Ince, the ex-footballer, has become an Internet sensation with his windshield wiper wave on All Stars Mr. and Mrs. There’s never a dull moment on that show as stars come on and surprise viewers with their quirky actions. I’ll bet Phillip Schofield mimics that wave for weeks to come.